Permabear - What Does It Mean? 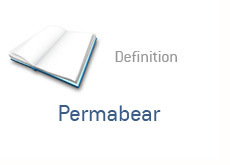 What is the definition of a "permabear"? The opposite of a "permabear" is a "permabull". This is someone who has a rosy and optimistic view of the markets, no matter what transpires. A permabear believes that there is always a monster lurking around the corner, waiting to take a bit out of the markets. Permabears have had the attention of the investing public over the past two years, due to the implosion of equity markets worldwide. Permabulls point out that the recession is nearly over, and economic growth is just around the corner. Permabears point out that the US government is borrowing money at an alarming pace, printing dollars like crazy and diluting their currency at a rapid speed. Permabears point out that economy-wrecking hyperinflation is just around the corner, due to the policies of the US government. A permabear is permanently bearish on both the economy and equity markets.